We’ve talked to many customers who are doing their work out in the field-- whether surveying for structure repairs, delivering meals, or deploying rescuers to emergencies and natural disaster sites, their apps have helped them share information and stay connected during critical times. Recently we spoke with Thomas, who works as a subcontractor of a utility construction firm. Thomas’s job is to identify and propose potential job construction opportunities for the company. Thomas is almost never working out of an office, but needs a way to record information while surveying properties and relay that data back to a static source. He also needs to identify locations via a map, and associate them with information about potential new leads for the construction firm. Thomas receives job assignments via a PDF file and extracts data from it using backend scripting. Then, he provides the construction company a suggestion of service for each address. Though he had convinced his contractor to go electronic with this process, information still needed to be hand-written and translated into PDFs. And PDFs are difficult to work with if you need to interact with the data they contain. Through backend scripts, Thomas has been able to retrieve the assignment data from the PDF files, which he then translates to a spreadsheet. The spreadsheet allows him to set up his assignment information the way he needs in order to translate it into a mobile app with AppSheet. Though he must do a bit of work on his end to get the initial data into the spreadsheet, once he has a functional spreadsheet, AppSheet handles the rest. While he’s surveying a potential opportunity, he uses his app to send the site information back to his office employee, who can present it to Thomas’s client. While Thomas drives around all day collecting data, his colleague in the office can see the data in real time and share it with clients, taking that burden off Thomas's shoulders. The Map view in his app allows them both to identify and locate properties efficiently. Thomas has also found ways to juxtapose AppSheet's features with functions found on his own device. Because he's constantly recording information from out in the field, he needs to be able to input content directly into his app without having to spend time typing on the touch screen. Thomas has found that his phone's voice recognition software allows him to speak his comments directly into the app. In fact he's found this solution so useful he compares it to a piece of jewelry that jazzes up an outfit! "It's like some free jewelry that goes perfectly with the AppSheet outfit when preparing to go to the Content Management and Creation Party. The outfit is fine without it, but it adds to the professionalism and overall attractiveness of the ensemble, to the extent you would consider something else completely before using one without the other." We love the analogy! And we especially love how he's been able to unlock mobile features that help make his apps more powerful. On the other hand, he uses his app every weekday and says it’s been easy for him and his colleague to adapt to. “As I go around updating these addresses with information, there’s a guy in the office that needs that information to submit it to our client. At his leisure he can pull the app up on his desktop and he can see all the information he needs and submit it at his will,” he says. Thomas and his office-based coworker have been using the app for about a month without any issues. He also has several other intricate ideas for his apps that include automating his billing processes and mapping locations with more complex relational details. 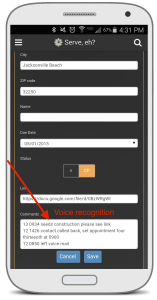 Do you need a mobile app to track and share information collected offsite? Check out our sample gallery to get some inspiration on how you can build your own app for field service and data collection.